Founded in 1886, the Royal British Columbia Museum (sometimes referred to as Royal BC Museum) consists of The Province of British Columbia's natural and human history museum as well as the British Columbia Provincial Archives. The museum is located in Victoria, British Columbia, Canada. The "Royal" title was approved by Queen Elizabeth II and bestowed by HRH Prince Philip in 1987, to coincide with a Royal tour of that year. The museum merged with the British Columbia Provincial Archives in 2003. The Royal BC Museum includes three permanent galleries: natural history, modern history, and local First Nations’ history. The museum’s collections comprise approximately 7 million objects, including natural history specimens, artifacts, and archival records. The natural history collections have 750,000 records of specimens almost exclusively from BC and neighbouring states, provinces, or territories. The collections are divided into eight disciplines: Entomology, Botany, Palaeontology, Ichthyology, Invertebrate Zoology, Herpetology, Mammalogy, and Ornithology. The museum also hosts touring exhibitions. Previous exhibitions have included artifacts related to the RMS Titanic, Leonardo da Vinci, Egyptian artifacts, the Vikings, the British Columbia gold rushes and Genghis Khan. 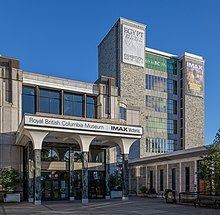 The Royal BC Museum partners with and houses the IMAX Victoria theater, which shows educational films as well as commercial entertainment. The museum is beside Victoria's Inner Harbour, between the Empress Hotel and the Legislature Buildings. The museum anchors the Royal BC Museum Cultural Precinct, a surrounding area with historical sites and monuments, including Thunderbird Park. The museum also operates traveling exhibitions which tour the province of BC, as well as international exhibits Guangzhou, China. On March 26, 2012, Jack Lohman was appointed CEO of the Royal BC Museum. Various groups assist with the development, success, and maintenance of the Royal BC Museum. These include volunteers, who number over 500 and outnumber the Royal BC Museum staff 4 to 1; the Royal BC Museum Foundation (formerly Friends of the Royal BC Museum Foundation), a non-profit organization created in 1970 to support the Royal BC Museum financially and to assist its work by forming links within the community; Security Services, responsible for risk management, emergency response, security services, and business continuity expertise; and Property Management and Operations, who focus on sustainability, recycling, and environment control within the museum. The Royal British Columbia Museum moved to its present location in 1968. On October 25, 1886, the 15-by-20-foot Provincial Museum of Natural History and Anthropology opened in the Birdcages (the former BC Legislative buildings). The first curator was naturalist John Fannin, who donated his own large collection of preserved birds and animals to the museum. After its inception, the Royal BC Museum continually expanded. In 1896, the museum was given space in the east wing of the new Legislative buildings. The museum’s mandate was updated by the BC government in 1913, and the collection of natural history specimens and anthropological material became official parts of the museum’s operations, as well as the dissemination of knowledge to the people of British Columbia. In 1921, the basement of the east annex of the Legislature was excavated to provide the museum with additional room. As part of the 1967 Canadian centenary celebrations, BC Premier W. A. C. Bennett committed to building a new home for the Royal BC Museum. It opened on August 16, 1968, with a final construction budget of $9.5 million. The museum remains housed in this building. The museum is situated in the cultural precinct, an area comprising various significant historical buildings near the Inner Harbour. The cultural precinct occupies the space between Douglas Street, Belleville Street, and Government Street. Included in the cultural precinct is the BC Archives, Helmcken House, St. Ann's Schoolhouse (built in 1844), the Netherlands Centennial Carillon, Thunderbird Park, and Mungo Martin House, Wawadit'la, a traditional big house built by Mungo Martin and his family. An exhibit at the First Peoples gallery. The Royal BC Museum hosts 3 permanent galleries (Modern History, Natural History, and First Peoples galleries) focused on BC history and heritage. The First Peoples gallery on the third floor contains a large collection of First Nations artifacts, and many of the artifacts in the gallery are from the Haida people. Artifacts in the First Peoples Gallery include a village model, as well as indigenous totem poles, garb, and masks (including Kwakwaka'wakw ceremonial masks made by Chief Nakap'ankam (Mungo Martin)). Notably, the gallery maintains the long house of Chief Kwakwabalasami (Jonathan Hunt), a Kwakwaka'wakw chief from Tsaxis (Fort Rupert). The house and surrounding carvings were created by his son, Henry Hunt, and his grandsons, Tony Hunt and Richard Hunt. An exhibit of artist Bill Reid's argillite carvings are also available for viewing. The gallery has been criticized by indigenous scholars for its portrayal of First Nations people, and its use of controversial images and film from Edward Curtis. In 2010, many of the museum's Nisga'a artifacts were returned to the Nisga'a people and now reside in the Nisga'a Museum in northwestern British Columbia. Recreation of an early 20th century garage in the modern history gallery. The Modern History gallery on the third floor (12,524 sq. ft.) begins with "Century Hall," a collection of artifacts and replicas of BC's history over the last 200 years. Visitors pass into "Old Town," a life-sized model of Victoria in the 1870s–1920s. Old Town was designed and constructed between 1969 and 1972, and presents twenty separate building displays of various scales, including a replica of a cobblestone streetscape of early twentieth-century Victoria (with a silent movie theatre, a hotel, a train station, old automobiles, and Chinatown). The display shifts to a tour of early forestry, fishing, and mining industries (including a mine shaft and Cornish water wheel). Also within the Modern History gallery is an exploration narrative containing models of the original Fort Victoria, a Port Moody train station, the 1902 Tremblay Homestead (from Peace River District), and a large-scale replica of Captain George Vancouver's ship the HMS Discovery. The diorama of a woolly mammoth in the natural history gallery. The natural history gallery on the second floor (12,387 sq./ft.) contains information, artifacts, and life-sized displays of the diverse geography of the province from prehistoric time to present day (including the Fraser River delta and the popular woolly mammoth). There is a range of fossils and taxidermic specimens, and a tide pool that contains live crabs, limpids, and starfish, among constructed specimens. More recently, a section on climate was added to the Natural History gallery, including information on the effects of modern climate change. Visitors may also view the Ocean Station in this gallery, a mock Victorian-era submarine that houses a 360-litre aquarium. The Royal BC Museum's collection policy states that the museum's collection must pertain to the natural or human history of BC. The collection is divided into specific categories of "significant objects," "representative objects," and "comparative objects." The Museum Act authorizes the Royal BC Museum to enable the preservation and management of the collection by securing, receiving, providing access to, and maintaining artifacts that adroitly illustrate the natural or human history of British Columbia. Pre-Columbian arrowheads on display at the museum. The museum houses a number of historical artifacts of the people of British Columbia. The human history department aims to represent the cultural, social, and economic history of the peoples of BC. Collecting anthropological artifacts has been a practice of the Royal BC Museum since its founding in 1886. Currently, a significant amount of artifacts from the human history department are being repatriated to First Nations groups. The Human History department is responsible for representing the material cultural history of BC. This division of the Human History department houses over 192 000 artifacts. The Royal BC Museum holds the largest collection of First Nations archaeological material from BC. The ethnology collection at the Royal BC Museum contains over 14 000 indigenous artifacts. These artifacts include both ceremonial and utilitarian objects and were collected from various First Nations groups around BC. The Modern History department is aimed at portraying BC's history through material culture. There are 165 000 artifacts in the collection ranging from silverware to textiles to furniture to items related to canneries, mines, and breweries. Notably, the collection includes a lion's head from the 1970s Vancouver Chinese Freemasons Athletic Club that exemplifies the traditional Hoshan style, as well as the Man Yuk Tong collection that preserves the authentic herbs, prescriptions, and miscellaneous implements used in the original Chinese Herbalist Shop. The Natural History department has been a part of the Royal BC Museum since 1886. The department includes curators, collection managers, and a mammal and bird preparator. The Natural History collections are divided into eight disciplines: Entomology, Botany, Mammalogy, Ornithology, Ichthyology, Invertebrate Zoology, Palaeontology, and Herpetology. This department develops the records representing the province's biodiversity by collecting or accepting donations each year; processing them into the collections; and making the specimens and records available to the general public, as well as to scientific and educational communities. Tooth of a megalodon on display at the museum. The museum boats a fossil collection of approximately 55,000 specimens. The fossil collection at the Royal BC Museum boasts approximately 55 000 specimens. The collection integrates specimens from all over BC ranging from 600 million years old to 20 000 years old. The palaeontology discipline also includes rock specimens from various mines around BC. The botany discipline centres on the various plants of BC and the collection includes over 200 000 specimens. Notably, the Royal BC Museum houses one of the oldest native plant gardens in western Canada (begun in 1967), where approximately 400 native species grow. The invertebrate collection is largely focused on marine, freshwater, and terrestrial invertebrate species from BC (insects, arachnids, and their relatives are represented in the entomology discipline). The collection consists of approximately 65 000 lots of marine and freshwater invertebrates, including marine molluscs, echinoderms, crustaceans, and polychaetes. This discipline also hosts a smaller global collection of dried gastropods, chitons, and bivalves. Notable specimens include more than 250 “type” specimens, each one used in the original description of a particular species. The entomology discipline focuses on specimens of insects, arachnids, and their relatives. As of 2010, the entomology collection included approximately 245 000 accessioned specimens and another 150 000 specimens not yet accessioned. The majority of the specimens are collected from BC, although some specimens have been culled from international areas. This collection provides basic information for assessing the status of BC insects and other terrestrial arthropods. It is also used to construct species range maps, supply useful information on species life histories and habitat requirements, and identify unknown specimens. The ichthyology discipline is primarily dedicated to studying the fish of BC. The collection consists of approximately 14 000 specimens of marine and freshwater fish. This discipline is concerned with amphibians and reptiles of BC. The herpetology collection consists of approximately 5000 lots from BC. This discipline mainly consists of bird specimens from BC, with a distinct focus on common seabirds, waterfowl, raptors, grouse, common shorebirds, alcids, gulls, woodpeckers, and common passerines. The ornithology collection contains 19 335 study skins, 3027 skeletons, 2713 clutches of eggs, 375 nests and 43 fluid-preserved specimens. This discipline focuses on a collection of mammals, the majority of which are from BC. The collection includes 18 000 specimens, largely made up of skeletons. The Conservation Services Department of the Royal BC Museum preserves the museum's artifacts, documents, and specimens. Conservators speak to interested groups, lecture, consult, advise, and work with students and interns from conservation programmes around the world. The department was established in 1966 and was the first conservation lab in western Canada, and one of the first facilities for artifact conservation in Canada. In the 1970s and 1980s, conservators and conservation scientists worked with the Haida people on the preservation of the poles at Ninstints. Since the discovery of the remains of Kwäday Dän Ts’inchi in 1999, conservators have been involved with the Champagne and Aishihik people in recovery, analysis, treatment and publication projects. The Learning and Visitor Experience initiative at the Royal BC Museum runs public programs, workshops, lectures, guided tours, and special events—all geared toward educating and engaging visitors. Roughly fifty school, family, and adult programs are scheduled per year. There are also annual events, including Remembrance Day commemorations, the Heritage Fair, and a Carol Along with the Carillon and other Christmas activities at Helmcken House. By 2002 the RBCM had initiated a successful and innovative province-wide research and public education program that explored human and natural influences on regional environments combining cultural heritage with natural heritage. The museum maintained a Living Landscapes website. Living Landscapes was an award-winning, successful "regional outreach program involving intensive cooperation with other museums, First Nations, educators, naturalists, and other agencies." Its goal was "to encourage and facilitate the exploration and appreciation of the human and natural history of British Columbia from regional perspectives," and it focused on "particular regions of B.C. and integrating stories and research locally generated with both research knowledge and descriptive information from the collections and curatorial staff at the Royal British Columbia Museum." In 2000 the focus of Living Landscapes was on the Upper Fraser Basin, a "vast area extending across most of south-central British Columbia including the Fraser River valley upstream from Big Bar Creek, as well as it is tributary drainages such as the Chilcotin, Quesnel, and Nechako Rivers." During 2001-2002 RBCM hosted five Upper Fraser Basin communities including, Valemount, British Columbia, Burns Lake, Williams Lake, Quesnel and Prince George attended by approximately 4,500 people. Visitors met and interacted with local Living Landscapes researchers and Victoria-based RBCM curators. The events featured exhibits from the RBCM's permanent collections as well as "illustrated talks and demonstrations on a variety of topics by local and museum experts." Initially, Living Landscapes focused on "in-field programming has been the northern, central and southern interior of British Columbia." In March 2006, when they had successfully completed the Northwest region, they discontinued the in-field programming. The Exhibition Arts department began in the early 1970s, and now construct all of the Royal BC Museum exhibits in-house. The department is responsible for maintaining the permanent galleries and constructing the exhibitions, as well as setting them up and taking them down. The Exhibition Arts department is made up of specialists with a variety of skill sets, including carpenters, blacksmiths, metal workers, welders, and people who specialize in casting, finishing, jewellery, multimedia, lighting, large format printing, and software and hardware computation. The RBCM began publishing in 1891, when then-curator John Fannin published a Check List of British Columbia Birds. The museum has produced thousands of books, papers, pamphlets and other documents about its collections, research and activities since that time. Beginning in 1993, the RBCM distributes through major Canadian distributors, including the University of British Columbia Press and Heritage Distributors. The museum publishes around four titles per year and has more than forty books in print. Ford, John K. B. Marine Mammals of British Columbia. Victoria: Royal BC Museum, 2014. Forsyth, Robert G. Land Snails of British Columbia. Victoria: RBCM, 2004. Graham-Bell, Margaret. Preventive Conservation: A Manual. Victoria: BCMA, 1983. (2nd ed. 1986) Green, David M, Patrick T. Gregory, and Brent M. Matsuda. Amphibians and Reptiles of British Columbia. Victoria: RBCM, 2006. Griffin, Robert and Nancy Oke. Feeding the Family: 100 Years of Food and Drink in Victoria. Victoria: RBCM, May 2011. Lohman, Jack. Museums at the Crossroads? Essays on Cultural Institutions in a Time of Change. Victoria: Royal BC Museum, 2013. Lohman, Jack. Treasures of the Royal BC Museum and Archives. Victoria: Royal BC Museum, 2015. Marc, Jacques. Pacific Coast Ship China. Victoria: RBCM, 2009. Van Tol, Alex. Aliens Among Us: Invasive Animals and Plants in British Columbia. Victoria: Royal BC Museum, 2015. Ward, Phillip R. Keeping the Past Alive. Victoria: Friends of the BCPM, 1974. ^ "Goals, Strategies, Measures and Targets" (PDF). Royal BC Museum 2016/17 Annual Service Plan Report. Royal British Columbia Museum. 2017. p. 9. Retrieved 25 August 2018. ^ "Royal BC MuseuM annual Report 2012 – 2013" (PDF). Royal British Columbia Museum. Retrieved 24 September 2013. ^ "FAQ". IMAX Victoria Theatre. Retrieved 23 May 2016. ^ "Royal BC Museum CEO Awarded CBE Honour". RBCM News Release. 16 June 2012. ^ a b "About the RBCM" (PDF). RBCM News Release. 12 September 2012. Retrieved 9 November 2012. ^ Corley-Smith, Peter. White Bears and Other Curiosities: The First 100 Years of the Royal British Columbia Museum. Royal BC Museum, 1989. ^ Norris, Thomas. "Dictionary of Canadian Biography Online: Fannin, John." http://www.biographi.ca/EN/009004-119.01-e.php?id_nbr=6703 . 2000. Accessed 23 January 2013. ^ Royal BC Museum. "Exhibits and Galleries." http://www.royalbcmuseum.bc.ca/Exhibit_Gall . 2012. Accessed 20 October 2012. ^ Royal BC Museum. "First Peoples Gallery." http://www.royalbcmuseum.bc.ca/First_People_Gall . 2012. Accessed 20 October 2012. ^ Royal BC Museum. "Modern History Gallery." http://www.royalbcmuseum.bc.ca/ModernHistoryGallery. 2012. Accessed 20 October 2012. ^ Royal BC Museum. "Natural History Gallery." http://www.royalbcmuseum.bc.ca/Nat_Hist_Gall . 2012. Accessed 20 October 2012. ^ Royal BC Museum. "Collections Policy." http://royalbcmuseum.bc.ca/Reports_Policy/Collection_Policy.aspx . June 2012. Accessed 1 February 2013. ^ Royal BC Museum. "Collections Policy." http://royalbcmuseum.bc.ca/Content_Files/Collection_Policy.pdf . June 2012. Accessed 1 February 2013. ^ Royal BC Museum. "Social, Economic, and Cultural Representation." http://www.royalbcmuseum.bc.ca/guidelines/social.aspx . 2012. Accessed 26 October 2012. ^ Royal BC Museum. "Archaeology." http://www.royalbcmuseum.bc.ca/Human_History/Archaeology . 2012. Accessed 20 October 2012. ^ Royal BC Museum. "Ethnology." http://www.royalbcmuseum.bc.ca/Human_History/Ethnolgy . 2012. Accessed 20 October 2012. ^ Royal BC Museum. "History." http://www.royalbcmuseum.bc.ca/Human_History/History . 2012. Accessed 20 October 2012. ^ Royal BC Museum. "Natural History". http://www.royalbcmuseum.bc.ca/Natural_History . 2012. Accessed 20 October 2012. ^ Royal BC Museum. "Fossils and Paleobotany." http://www.royalbcmuseum.bc.ca/Natural_History/Fossils_and_Paleobotany.aspx . 2012. Accessed 20 October 2012. ^ The Royal BC Museum. "Plants." http://www.royalbcmuseum.bc.ca/Natural_History/Plants.aspx . 2012. Accessed 20 October 2012. ^ Royal BC Museum. "Invertebrates." http://www.royalbcmuseum.bc.ca/Natural_History/Invertebrates.aspx . 2012. Accessed 20 October 2012. ^ Royal BC Museum. "Insects and Relatives." http://www.royalbcmuseum.bc.ca/Natural_History/Insects-and-Relatives.aspx . 2012. Accessed 20 October 2012. ^ The Royal BC Museum. "Fish." http://www.royalbcmuseum.bc.ca/Natural_History/fish.aspx . 2012. Accessed 20 October 2012. ^ The Royal BC Museum. "Amphibians and Reptiles." http://www.royalbcmuseum.bc.ca/Natural_History/Amphibians_and_Reptiles.aspx . 2012. Accessed 20 October 2012. ^ The Royal BC Museum. "Birds." http://www.royalbcmuseum.bc.ca/Natural_History/birds.aspx . 2012. Accessed 20 October 2012. ^ The Royal BC Museum. "Mammals." http://www.royalbcmuseum.bc.ca/Natural_History/Mammals.aspx . 2012. Accessed 20 October 2012. ^ Royal BC Museum. "Conservation Services". http://www.royalbcmuseum.bc.ca/Conservation . 2012. Accessed 20 October 2012. ^ Royal BC Museum. "Schools and Kids." http://www.royalbcmuseum.bc.ca/Sch_Kid . 2012. Accessed 20 October 2012. ^ a b Royal BC Museum 2002. ^ a b Royal BC Museum 2006. ^ Royal BC Museum 2000. ^ Royal BC Museum. "Exhibits & Galleries." http://www.royalbcmuseum.bc.ca/Exhibit_Gall . 2012. Accessed 20 October 2012. ^ Royal BC Museum blog. "Book Talk." http://blog.royalbcmuseum.bc.ca/2010_06_01_archive.html June 2010. Accessed 1 November 2012. ^ a b c d e f g h i j k l m n o p q r s t u v w x y z aa ab ac ad ae af ag ah ai aj ak al am an ao ap aq Royal BC Museum. "Royal BC Museum Publications." http://www.royalbcmuseum.bc.ca/Publications/default.aspx . 2012. Accessed 1 October 2012. ^ a b c Royal BC Museum. "Royal BC Museum Publications." http://www.royalbcmuseum.bc.ca/Publications/default.aspx . 2012. Accessed 1 October 2012. Wikimedia Commons has media related to Royal British Columbia Museum. This page was last edited on 1 October 2018, at 04:11 (UTC).